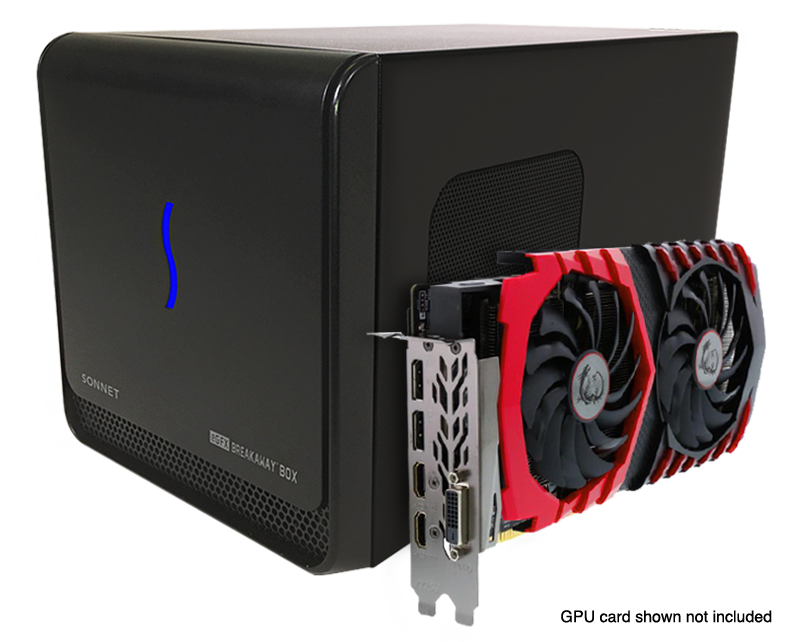 Sonnet’s eGFX Breakaway Box Thunderbolt 3 to eGPU PCIe card expansion systems are designed specifically to accommodate large and power-hungry GPU cards. 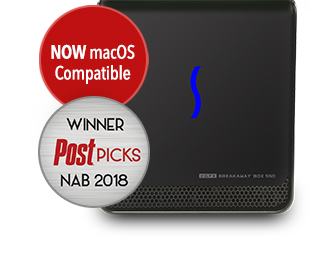 Functioning as a simple plug-in upgrade, a Breakaway Box boosts the graphics performance of an eGFX-compatible computer by connecting a high-performance desktop GPU card via a Thunderbolt 3 port. 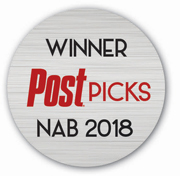 With four models to choose from, the Breakaway Box line supports all Thunderbolt-compatible cards(1) with popular GPU chipsets—such as AMD Radeon™ R9 and RX series, including VEGA 64 and Frontier Edition; and NVIDIA® GeForce® GTX 9 and 10 series, and TITAN X, Xp, and V. Even the latest pro cards—AMD Radeon Pro WX 5100, WX 7100, WX 9100, and SSG; and NVIDIA Quadro® GP100, P4000, P5000, and P6000—are supported! Alternatively, if you are need a cost-effective Thunderbolt expansion system for a Thunderbolt-compatible, non-GPU PCIe card, the Breakaway Box offers all the space and power you could possibly need at an affordable price. There’s no need for you to carry a heavy and expensive gaming laptop to have a great gaming experience—just plug in a Breakaway Box and add the GPU power you want when you need it! By delivering significantly higher frame rates for smooth game play, the Breakaway Box is ideal for enabling graphic-intensive gaming on Ultrabook™ and other thin/light notebook computers that otherwise would deliver a poor gaming experience. When used with an eGFX-compatible computer, accelerated graphics can either be displayed on your notebook’s own display panel or on multiple external monitors. And, unlike with gaming laptops, when the next generation of GPUs ships and you are ready for another performance boost, simply upgrade the GPU card in the Box—nobody should have to replace their computer just to keep up with the latest in GPU technology. For a highly-portable eGPU solution, check out Sonnet’s eGFX Breakaway Pucks. From editing to rendering to color grading, and from animation to special effects, many applications rely on GPU cards to do the heavy lifting. 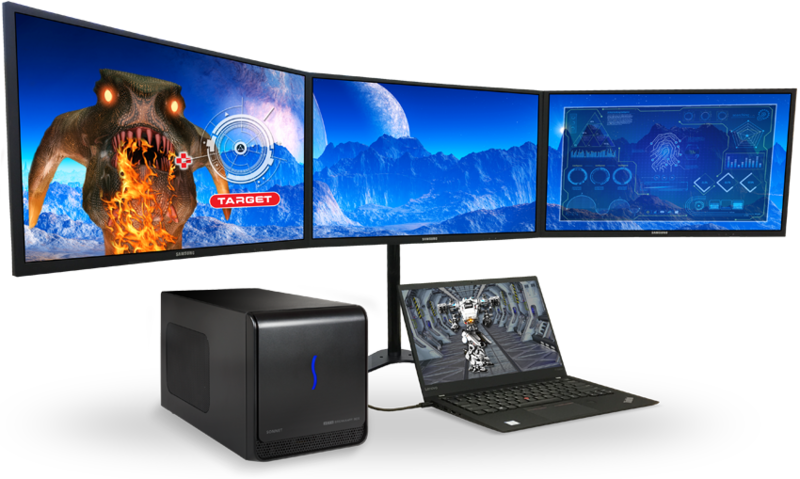 With a GPU card installed, the Breakaway Box can accelerate your video production workflow. In addition to GPU cards, the Breakaway Box supports every other Thunderbolt-compatible PCIe card, up to full-length, full-height, double-width. Its single x16 PCIe 3.0 slot easily accommodates full-length cards such as the Avid® Pro Tools|HDX(4) or RED® ROCKET-X. 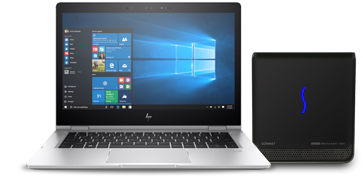 The Breakaway Box’s single-port 40Gbps Thunderbolt 3 interface ensures the full 2750 MB/s of PCIe bandwidth(2) is dedicated to the installed card. 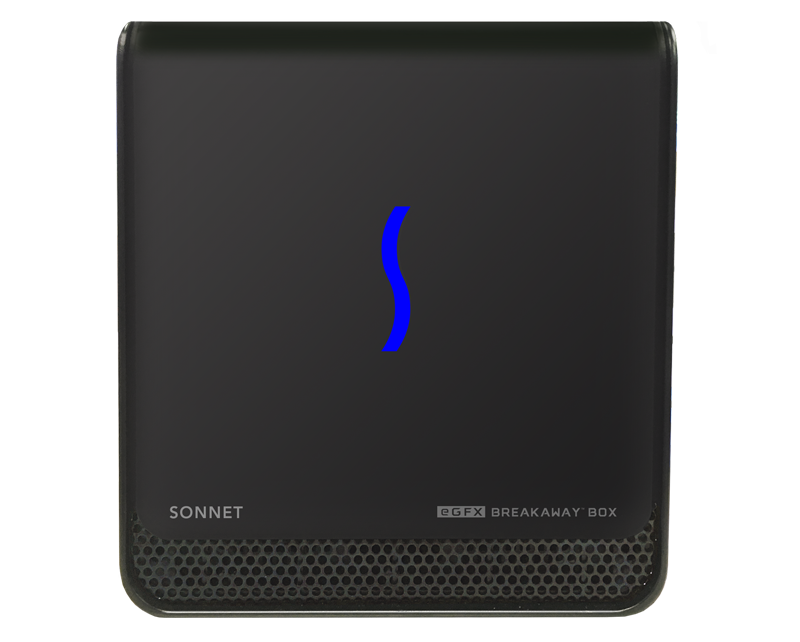 The Sonnet eGFX Breakaway Box is the coolest and quietest eGFX box on the market—with its large variable-speed, temperature-controlled fan that quietly and effectively cools the installed card, the Breakaway Box can be comfortably used in noise-sensitive working environments. In today’s pro audio and video production, use of audio I/O and DSP cards (such as the Avid Pro Tools|HDX), and video I/O and transcoding cards (such as the or RED ROCKET-X) is essential to keeping up with recording sessions, as well as on-set and post-production timelines. The eGFX Breakaway Box is ideal for supporting the acceleration of these workflows. Thunderbolt 3 is a leap forward in every way. 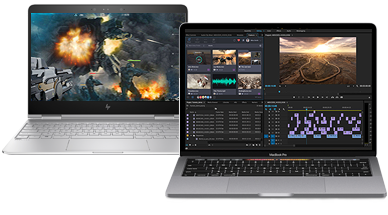 Whether you’re editing high-frame-rate 4k video, or blasting aliens out of the sky, you can now transform your notebook into a true desktop experience. With up to 2750 MB/s available PCIe bandwidth(2), the Breakaway Box exploits its 40Gbps Thunderbolt 3 interface to offer the best possible eGPU experience, or handle the most demanding, highest performance PCIe cards. All Breakaway models are Thunderbolt Certified, and include a 0.5-meter Thunderbolt 3 (40Gbps) cable to connect the system to your computer. Choose the one that best suits the power requirements of the card you intend to use, or you can opt for the model with an included GPU card. Includes one 8-pin (6+2 pin) plus one 6-pin auxiliary power connectors; supports cards requiring up to 300W of power (equivalent to 500W [sometimes 600W] recommended system power); and provides 15W of upstream power. This model provides enough power for most GPU cards; see the list of cards supported on the eGPU/OS tab. Includes two 8-pin (6+2 pin) auxiliary power connectors; supports cards requiring 375W of power (equivalent to 600W recommended system power); and provides 87W of upstream power, useful for charging your notebook. This model supports nearly every compatible GPU card, with the exception of ones such as the AMD Radeon RX Vega 64, Vega Frontier Edition, WX 9100, and overclocked NVIDIA cards with extremely high peak power requirements; see the list of cards supported on the eGPU/OS tab. Includes two 8-pin (6+2 pin) auxiliary power connectors; supports cards requiring 375W of continuous power plus an additional 100W peak power (equivalent to 750W recommended system power); and provides 87W of upstream power, useful for charging your notebook. AMD approved for the air-cooled editions of the AMD Radeon RX Vega 64, Vega Frontier Edition, and Radeon Pro WX 9100, this model was designed and qualified to also support overclocked NVIDIA cards with high peak power requirements; see the list of cards supported on the eGPU/OS tab. 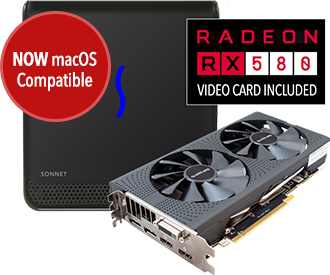 Includes a Sapphire Pulse Radeon RX 580 8GB card, and provides 60W of upstream power. Belkin USB-C to 4-port USB-A hub provided with original Apple External Graphics Development Kit not included. Contact us at 1-949-587-3500 x2 or email to confirm card and computer compatibility. Breakaway Box and Breakaway Box Developer Edition are not compatible with 2018 13" MacBook Pro 15,2. The Breakaway Box 550 and 650 are fully compatible with all Thunderbolt 3 Macs. eGFX Breakaway Box models support up to a standard full-height, full-length, double-width card. Cards with three power connectors are not supported. While the eGFX Breakaway box features a 40Gbps Thunderbolt 3 interface, some computers equipped with Thunderbolt 3 use an x2 PCIe lane implementation of Thunderbolt 3 technology that limits PCIe performance to 20Gbps. Find more computer information here. Full performance also requires the use of the included Thunderbolt 3 (40Gbps) cable, or other Thunderbolt 3 (40Gbps) cables; look for the Thunderbolt icon AND the number 3 on the connector housings to identify these cables. 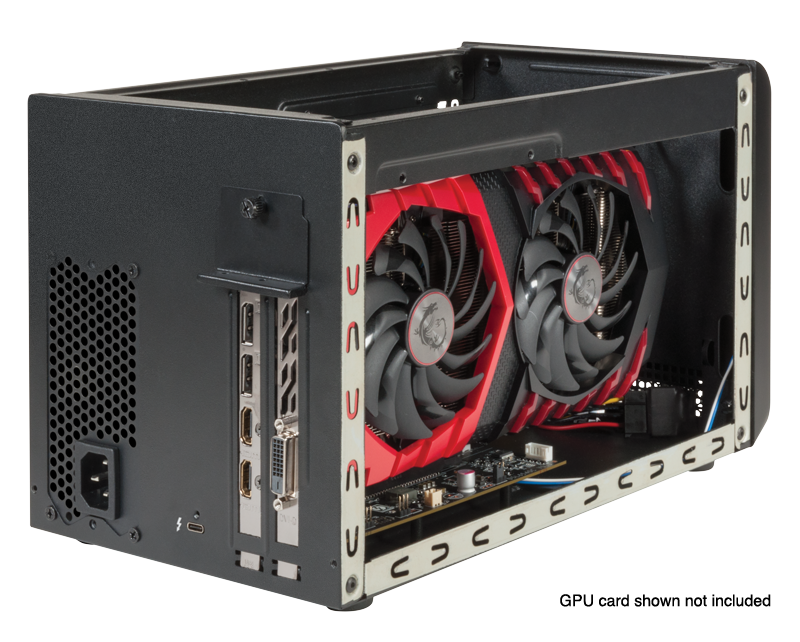 Choose eGFX Breakaway Box model that supports the power requirement of the chosen card. Power adapter cable for Avid Pro Tools|HDX card sold separately. See eGPU/OS Info tab for details. Future cards listed as they become available. 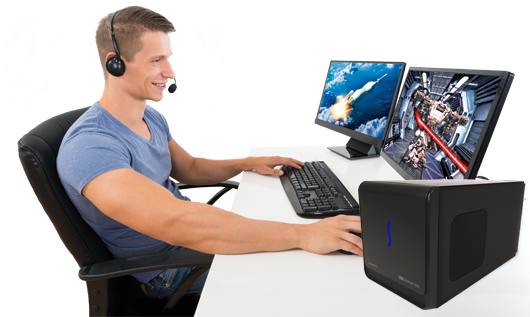 Latest video card and operating system (OS) information for eGFX Breakaway Box models. Thunderbolt 3 PC and eGPU installation info. 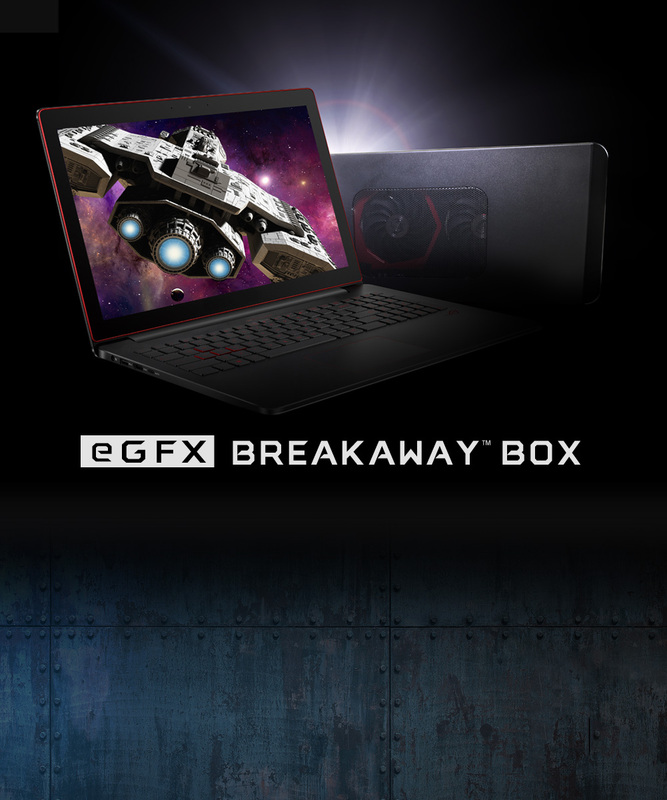 The eGFX Breakaway Box with the NVIDIA GeForce GTX 1080 Ti and connected to a Mac can speed up multi-GPU rendering in apps like Blender and Resolve (Noise Reduction render on the fly during playback); add CUDA support to your AMD equipped Macs thereby enabling 'CUDA only' apps like Octane Render to function and 'CUDA capable' apps like Blender to function faster than the "OpenCL only" AMD GPUs provided by Apple; provide a surge in the OpenCL render rate as well as combine with factory AMD GPUs to double the render rate; and triple and quadruple the frame rates of OpenGL apps like Valley and Tomb Raider. 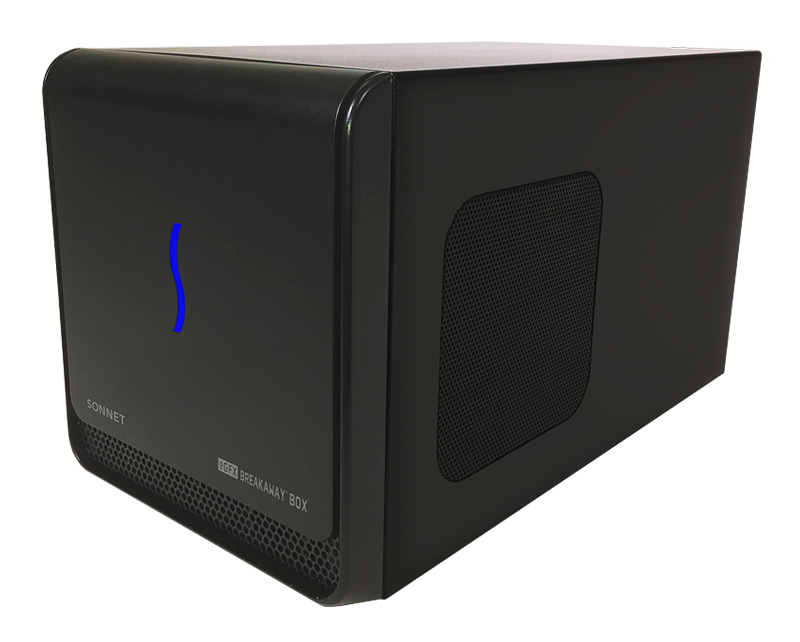 Sonnet Technologies came up with their own unique eGPU design. It includes all the best eGPU features such as quiet exhaust fan and the ability to send power to your 2016 MacBook Pro laptop. An nice touch was the PCIe Card Bracket Locking Plate. Unlike other eGPUs, the eGFX Breakaway Box does not require you to run the tb3-enabler in order to be detected as a supported Thunderbolt device. 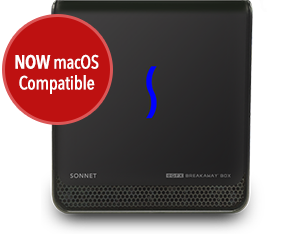 Priced at $299, the Sonnet Breakaway Box is an eGPU enclosure whose single purpose is to provide graphics performance boost through its sole Thunderbolt 3 port. For first impressions and additional photos, check out the unboxing post. The two components of this enclosure worth paying close attention to are the PSU and the main cooling fan. Both are built by Akasa, a supplier of thermal solutions to the electronics industry. The power supply is a 350W SFX unit. It’s custom-made to have one 24-pin main power cable, one 6-pin PCIe cable, and one 6-pin + 2 PCIe cable. 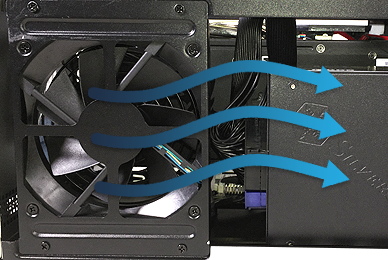 The 120mm fan is rated for 6.9 -16.05 dB(A), with 10 dB being the noise of a pin dropping. Airflow is routed out of the enclosure space behind the GPU and in front of the PSU. This main cooling fan is inaudible to my ears when a powerful graphics card is in use. Another cool aspect of the thermal control system is the fan bracket. It’s very sturdy which helps prevent vibration. of Intel Corporation in the U.S. and/or other countries. Other names and brands may be claimed as the property of others.